Food chains undergo massive changes when a top predator – such as great white sharks – are lost, reveals new research. The waters surrounding Seal Island in False Bay, near Cape Town in South Africa, are famous for great white sharks breaching out the water in pursuit of seals. But the recent disappearance of great whites from False Bay has led to the emergence of another apex predator, sevengill sharks, that now dominate the area. Researchers found that the disappearance of great whites has led to the emergence of sevengill sharks, a top predator from a different habitat. A living fossil, sevengill sharks closely resemble relatives from the Jurassic period, unique for having seven gills instead of the typical five in most other sharks. The findings are part of a long-term study between shark researcher Neil Hammerschlag, of the University of Miami Rosenstiel School of Marine and Atmospheric Science, and wildlife naturalist Chris Fallows, of Apex Shark Expeditions. 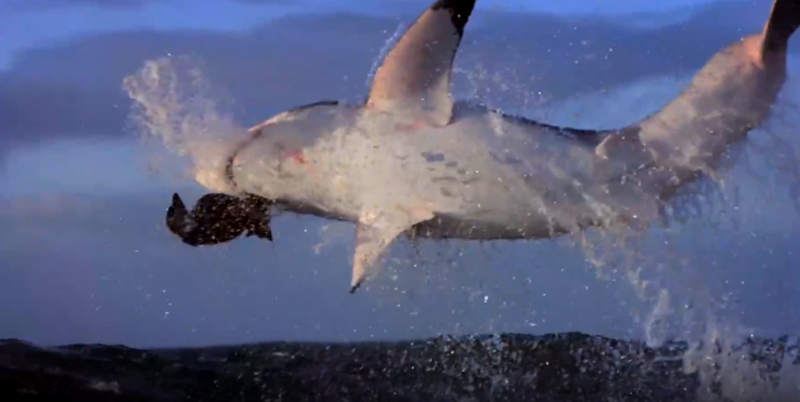 The research focused on the waters surrounding Seal Island in False Bay, a spot well known for its “flying” great white sharks that breach out of the water when attacking Cape fur seals. Since the year 2000, the research team has spent over 8,000 hours observing great whites from boats, during which they recorded 6,333 shark sightings, and 8,076 attacks on seals. The data revealed that for more than a decade, great white numbers were relatively stable, but in 2015 sightings began to drop off steeply. Study lead author Dr Hammerschlag said: “In 2017 and 2018, their numbers reached an all-time low, with great whites completely disappearing from our surveys for weeks and months at a time. Co-author Fallows said: “In 18-plus years of working at Seal Island, we had never seen sevengill sharks in our surveys. In South African waters, sevengill sharks have no equal in the food web with the exception of the great white and orca whale. Historically, the only well-known aggregation site for sevengills in False Bay was located 18 kms (11 moles) away from Seal Island within inshore kelp beds. The study suggested that the appearance of sevengill sharks at Seal Island was due to the disappearance of great whites, thereby allowing sevengills to exploit the area without risk of attack from great whites or competition with them for shared prey.